Cured Spanish jamon, either Serrano or Iberico, is made in the artisanal tradition. It is tasty and its nutritional properties make it ideal for a healthy, balanced diet. Today Spain is the world's leading producer and consumer of ham. Some 38.5 million hams and shoulders are processed each year, and every Spaniard eats nearly 5 kg of ham a year - twice as much as in Italy, second among the consuming countries. 1 What is Spanish jamon like? What is Spanish jamon like? Jamones are made from the hind legs of pigs. They are left raw, salted, washed after a few days and cured naturally for months or years. The smaller forelegs go through the same process, and the end result is called the paleta, or shoulder cut. There are several types of jamon, depending on the breed of pig, how the pigs are fed and where the jamones are produced. The Greek historian Strabo (1st century B.C.) wrote in book III of his Geography (devoted to Iberia) that the Carretanians, a people of Iberian stock who inhabited the western Pyrenees, made excellent jamones, comparable to those of Cantabria, which afforded them considerable revenues. In Roman times, cooks known as vicarius supra cenas specialised in making jamones reserved for the elite, especially the renowned jamones of Pomeipolis (today, Pamplona). Legend has it that jamon had its origin in a pig that fell into a very salty stream and drowned. A group of shepherds pulled the pig from the water, roasted it and discovered it had a pleasant flavour, especially the hind leg. They later discovered that salting the jamon made it keep much longer without losing its flavour, and they gradually perfected the technique until they achieved one of the best cured jamones in the world. You can find out more about the history of jamon in the following articles (in Spanish): El jamón en la gastronomía española. Apuntes para la historia I and II (by Antonio Gázquez). 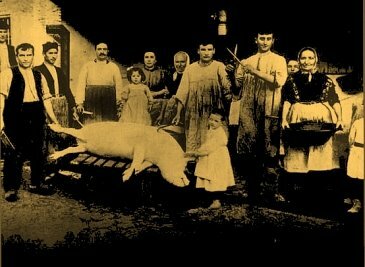 The Sala family, owners of the Museu de l'Embotit (sausage museum), during the traditional pig slaughtering ( matanza ) in the winter of 1904. The entire family took part in this tradition. Curing jamones is apparently a simple process. All you need is salt, air and time. Today the entire process - from slaughter and cutting to curing in the ageing room - takes place in clean, modern, high-tech facilities, ensuring continuous production, uniform quality and appropriate environmental conditions at all times. The process starts in conditions of low temperature and high humidity, and gradually the temperature is raised and the humidity lowered. It is a natural, spontaneous, ongoing transformation. Salting and rinsing. They are covered with salt for 7 to 10 days and then rinsed. Settling. In a cold environment, the salt that has permeated the flesh is distributed uniformly and the cut dries and becomes more consistent. This stage lasts 30 to 60 days. Drying and maturing. The jamones are hung in drying rooms for several months (between 6 and 9) at temperatures from 15 to 30º C. They continue drying and the aromas caused by the alteration of proteins and fat begin to emerge. This is usually the final stage in processing a Serrano jamon. Ageing in the ageing room. The biochemical processes initiated during curing and microbial flora give the jamones their characteristic final aroma and flavour. This part of the process takes place at temperatures between 15 and 20º C and relative humidity of 60-80% and lasts from 6 to 30 months. For more information, see our page on Iberico jamon production. Modern facilities are not at odds with artisanal processing. To the contrary! The best jamones are processed and controlled one by one. The end product is very different if, for example, the cuts are salted one by one or if they are placed in a row and salt is thrown over them by a wheel loader. It is very important to use the right amount of salt according to the cut's weight and shape and make sure it is evenly covered. This personalised care is essential in all stages of processing. The big differences in jamon prices are largely due to the care they get in processing. Until a few years ago nearly all families living in the country had one or two pigs, which they butchered in winter (December or January). 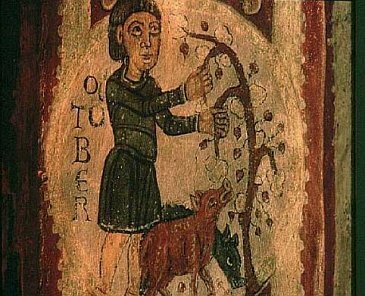 The matanza, or traditional pig slaughter, was a festive occasion when many of the perishable parts of the pig were eaten: blood, ribs, snout, etc.). Families of more modest means used jamones as a means of payment and consumed the various types of sausages (chorizo, salchichón) and other products that could be preserved by marinating, such as pork rind and loin. This is one of the most distinctive factors of jamones. The meat and, especially, the way the fat is distributed clearly distinguish a pig's breed. The meat of pigs belonging to white breeds is much leaner and the fat is on the outside. The jamones known as Jamones Serranos come from these hogs. These cuts are uniform, with reddish meat, white or slightly yellowish fat; they are slightly salty and characterised by a mild aroma. The meat from pigs of the Iberico breed, is criss-crossed with thin streaks of yellowish marbling fat. This gives it a glossier appearance and helps slow down the curing process, resulting in more complex, powerful aromas. The jamones from these pigs are known as Jamón Iberico . They are characterised by ivory-coloured fat, glossy meat ranging from deep red to purplish red and generous amounts of marbling fat. They are very flavourful, with intense, persistent aromas, faintly salty - almost sweet - and impart notes of curing, burnt sugar, nuts and the ageing room. Iberico jamon is also popularly known as Jamón Pata Negra ( black hoof ham ) because the skin and hoof of an Iberian hog are usually black. But this is not an official designation as there are varieties of Iberian pigs that are not black and there are also non-Iberian pigs with black or very dark hides. The most common cross is between Retintos or Lampiños and Duroc-Jersey (white). The proportion of Iberian stock is usually more than 75%, which is the minimum required by the four designations of origin for Iberian hogs. Hams from Mangalica pigs are also made in Spain. This is an autochthonous Hungarian breed that is a distant relative of the Iberian pig. The Mangalica has certain peculiarities: Its hair curls in spring, making it look somewhat like a sheep, and it has the highest percentage of fat of all pigs. This makes its hams and loins mature very slowly and, consequently, the aromas are richer. The Mangalica breed was in danger of becoming extinct for many years, but in 1990 a company in Segovia managed to acquire 90 breeding females. Production is very limited. Bellota: During the first months of life the pigs live on farms and their diet consists of mother's milk and compound feed. When they are around 10 months old and weigh between 92 and 115 kg, they are taken to an area of pastureland, where they feed on grass, legumes and acorns. These pasturelands are sparsely wooded meadows typical of the western Iberian peninsula. This period, known as the montanera, usually lasts two or three months, until the pig has added approximately 50% more of its entry weight. Recebo: A system similar to the above but with a shorter montanera and supplemented with compound feed. This category has disappeared with the new law. Cebo de Campo: Diet based on compound feed, grass and legumes for at least 2 months before slaughter in an area with a minimum of 100 m2 available per animal. In other words, only 100 pigs at most may be fattened in an enclosure occupying 1 hectare. These large spaces enable the animals to move around freely and exercise their muscles, resulting in better-quality ham. Cebo: Diet based on compound feed and legumes on farms, where each pig has only 2 m2 available. Jamones are made throughout the country, especially in mountainous areas with mild, dry climates in summer and cold winters, ideal for curing. It is the mountains that give Spanish cured jamones their name. Serrano means "from the sierra", a Spanish word used to describe a mountain range. But there are differences or nuances in production, depending on areas and producers. The Iberico ham designation ( Jamon Iberico ), according to recent legislation, can be used only in regions where the pasturelands described above are found: in the west and southwest of Spain. Each of these areas has a Designation of Origin with a regulatory board, although there are also producers not associated with it. Quality does not depend on the area where the Iberico jamones are made; it is guaranteed in all of them. As in the case of wine, the jamones coming from each production area have different sensory characteristics due to climate and autochthonous bacterial flora. The best way to find a favourite is to try jamones from all the different areas. Plata (Silver): Serrano jamones cured for 8 to 11 months. Oro (Gold): Serrano jamones cured for 11 to 14 months. Gran Serrano : Serrano jamones cured for more than 14 months. The quality of Serrano jamones varies widely, and is reflected in the price. There are three areas with their own grading seals that also process jamones from white pigs: Teruel (region of Aragon), Trévelez (Granada province, Andalusia) and Serón (Almería province, Andalusia). These jamones are of the highest quality on the peninsula for white pigs and are among the most popular. Designation of Origin "Jamón de Teruel"
Specific Designation "Jamón de Trevélez"
Protected Geographical Indication "Jamón de Serón"
The pigs in Teruel are crosses of Landrace and Duroc. The jamones are dried in natural drying areas with controlled ventilation and are matured in a natural environment also. The cuts are taken to drying rooms where they are hung in the optimal humidity and temperature conditions of the natural environment characteristic of a cold, dry area with an average altitude over 800 metres above sea level. In Trevélez pigs are crosses of Landrace, Large White and Duroc Jersey. Jamons have a rounded shape and are cured between 14 and 20 months. Their particular organoleptic characteristics come from the environment (medium-low area in Sierra Nevada Nature Park) where they are produced. The climate and vegetation result in the growth of a specific type of microbial flora. Curing takes place in facilities located between 1200 and 1900 metres above sea level, a cold area with lots of snow in winter and cool temperatures in summer. In the jamon curing process the proportion of protein increases and the fat decreases, making it lighter and healthier than the fresh product. The proteins are high-quality and rich in essential amino acids. A 100-gram serving of Serrano or Iberico jamon is the equivalent of 33% of the recommended daily protein intake. It contains unsaturated fatty acids (similar to those found in olive oil), vitamins B1 and B6, phosphorus, iron, potassium and zinc. And even though it is cured in salt, it contains only a tiny amount. Jamones from Iberian and white pigs differ considerably, not only in their sensory characteristics but also in their composition. This is due basically to the raw material and the processing. Iberico jamones have a higher protein content and more vitamin E as a result of their origin (hogs of Iberian breed) and because the pigs are reared in pastureland. Jamones from white pigs contain more salt because the curing time is shorter. Energywise, 100 grams of bellota-grade Iberico jamon provide 43 grams of proteins and less than 250 calories, so eating it in moderate amounts will not interfere with low-calorie diets. Jamon from Iberian pigs fed an acorn diet exclusively is high in monounsaturated fatty acids, which are also found in olive oil. It helps digestion and at the same time increases good cholesterol and reduces bad cholesterol. Iberico jamon also provides proteins, vitamins B1, B6, B12 and folic acid, which are beneficial for the nervous system and good brain function. It is rich in vitamin E, a powerful antioxidant, and in minerals like copper (essential for bones and cartilage), calcium, iron, zinc, magnesium, phosphorus and selenium. Selenium is linked to processes that retard ageing. Source: García Rebollo AJ, Ortiz Cansado A, Maciá Botejara E, Morales Blanco P. Influencia del consumo de jamón ibérico de bellota sobre el perfil lipídico aterogénico. Sólo Cerdo Ibérico (April 1999): 107-12. *The "recebo grade" has been eliminated by the new 2014 law. It covered jamones from pigs fattened in woodlands eating acorns and compound feed supplement. Cured hams are a product typical of southeastern Europe (Spain, Portugal, France and Italy) and are rarely found on other continents. Nevertheless, in spite of this concentrated production in a very specific area, processing and raw materials are so different that the end products have little in common. Spanish jamon usually has less moisture because of its lengthy curing process, plus a more consistent texture and more intense flavour (especially jamones from acorn-fed Iberian pigs). Comes from pigs reared in northern Italy in the Apennine foothills, fed partly on chestnuts. The ham is cured for at least 10 to 12 months. Its texture is smooth and not very consistent, and it is slightly salty with less intense flavour than Serrano jamon because it has a higher water content. 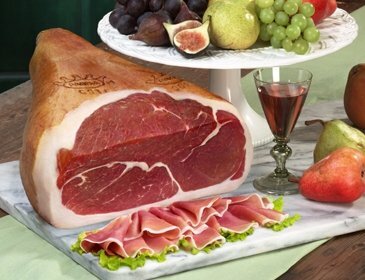 After Italy, France and the United States are the main consumers of this ham, which is very popular. It is the main international competitor of Spanish jamon. Made only in the town of San Daniele, it is Italy's second best-known ham. Its distinctive feature is its guitar shape. It is cured at least one year. It has a distinctive flavour resulting from smoking and the ingredients used. The culatello is the end of the ham (the tastiest part). It is often sold separately and is much more expensive. It should weigh at least 8.5 kg and the production process must be over 210 days. This category includes the much-prized Bigorre ham (French Pyrenees), which may cost as much as £69/kg. This ham comes from Gascony black pigs (Iberian type, the oldest in France) reared on the open range on a natural diet. It matures over a minimum of 130 days and must weigh more than 7.5 kg. This category includes hams from Bayonne and ham from the Ardennes, which are the only hams bearing the Protected Geographical Indication (PGI) label. Bayonne ham is the best known and most popular ham in France and is easily identified by the Basque cross, the lauburu, on the rind. It is sweeter than Serrano jamon. Other dried hams are: ham from Savoie, ham from Auvergne, ham from Laucaune and ham from Najac. It weighs at least 6.5 kg and is produced like dried ham, but has no minimum maturing time. The only origins authorised for this category are ham from Vendée and ham from Alsace. The latter produces smoked hams. This type of ham is also called jambon du pays (local ham). These hams are usually sold without the hoof and the skin slightly cut at the tip. Boneless ham, wet-cured, cold-smoked with aromas of beech wood and juniper berries. Boned and salted in aromatic brine. Cured in the open air with garlic, coriander and black pepper and smoked over spruce or pine branches. The sawdust gives it a typical dark colour and aroma. Round cut, rubbed in salt, brined, desalted, rinsed and cold-smoked with aromatic essences and then dried. 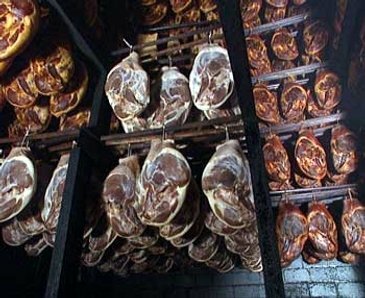 Unlike the French ham from the Ardennes, it is cold-smoked for several weeks before drying. 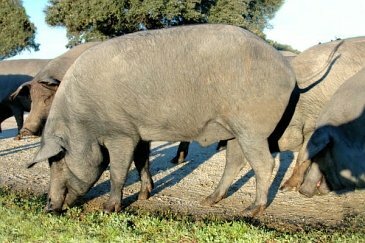 Iberian pigs in the Alentejo are slightly smaller than other Iberian hogs. These hams are not well known, even though they are produced next door to Extremadura, Huelva and Salamanca, the main Iberico-ham-producing places. The pigs are reared in pasturelands similar to those in Spain on a diet of acorns, and the end product is much like Spanish jamones. Originally made only in Smithfield, Virginia, since the mid 18th century it has also been made in Tennessee, Kentucky and North Carolina. Because of its origin, it is also known as Virginia ham. The pigs are Berkshire, which are almost black and have a high proportion of marbling fat that makes the hams suitable for lengthy curing. Up until the '60s the pigs' standard diet was peanuts, but today it is corn. The hams are markedly salty because they are salted for 40 days, at very low temperatures (3 or 4º C). Some producers mix the salt with sugar to sweeten and tenderise the meat. It is also common to add potassium nitrate to brighten the colour and as a preservative. After salting, the hams are matured at least 25 days at 25º C with 60% relative humidity. The best hams are cured up to four months and then smoked over wood like American walnut, oak, apple, maple or even pine. Smithfield hams are matured for six months to a year. They are commonly soaked for 4 to 24 hours before serving or cooking, depending on individual taste, to lessen the salty flavour. 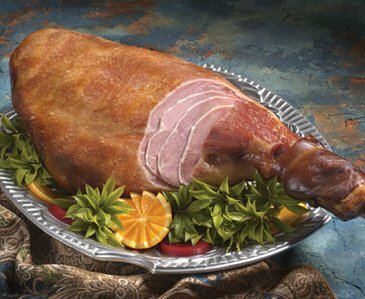 Unlike European hams, which are eaten as they come, American ham is usually baked, boiled or fried.